Make plans now to join us for our annual Golf Classic on Tuesday, May 21st at the Founders Course at Greystone Country Club! 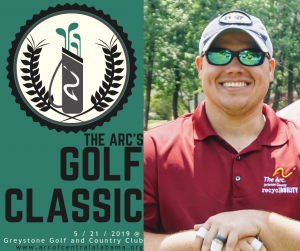 Please remember that sponsorships and donations are tax deductible and help support the mission of The Arc of Central Alabama. We are the largest provider of services to those with intellectual and developmental disabilities in the State of Alabama. The Arc is unique in that it serves anyone referred to the organization, regardless of the severity of medical issues or behavioral challenges. It also provides programming that spans a person’s lifetime. Sign up individually or join as a four-person team for an exciting day of golf! Registration includes a round of golf, lunch, snacks, drinks on the course, and admission to the scoring dinner. All donations are tax deductible. Many of our sponsorship benefits are time sensitive. Please confirm as soon as possible to get the full benefits of your sponsorship! Registration includes a round of golf, lunch, snacks, drinks on the course, and admission to the scoring dinner.